Two years have passed since EA released Tiger Woods PGA Tour 14. In 13’ Woods shared the cover with Rickie Fowler and Arnold Palmer in 2014. Tiger Woods PGA Tour 12 shipped without its star on the cover because of the athlete's personal controversies, leaving EA to place its focus on The Masters instead. It comes with little surprise that EA parted ways with Tiger Woods. In 2015, PGA Tour returns with Rory McIlory as its new face. 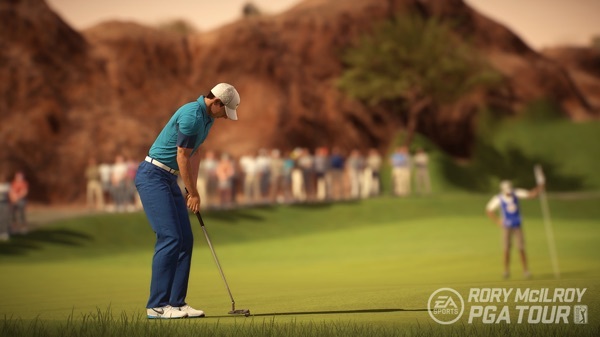 Apart from its new spokesman, Rory McIloryPGA Tour is the first golf game from EA to release on current consoles. With it comes the opportunity for EA to really change things up. They’ve had the last two years to rethink, retool, and bring new life to their franchise. Sadly, the game is extremely familiar to anyone who played a Tiger Woods game. There are three different swing styles, Arcade, Classic, and Tour. Arcade is classic Tiger Woods control: pull back and push forward to swing and add spin or boost. Pretty simple stuff. Classic offers the familiar three click meter used in many games of this type. 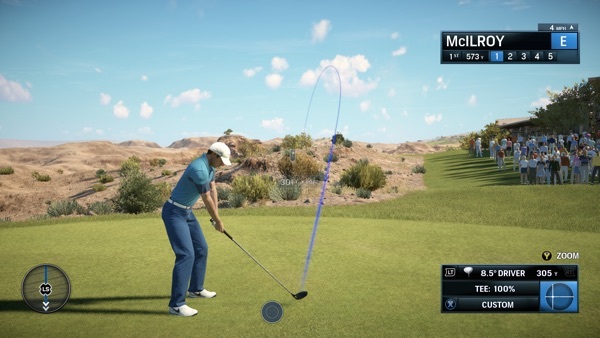 The Tour swing style is simply the Arcade swing but without the extra boosts. The game's controls are extremely familiar and that’s a good thing. They have always been great and continue to be. I would highly recommend series veterans to go straight into Tour mode because it offers the truest to life experience. Not being able to add spin when you over hit the ball or boost to fall way under a Par 5 hole makes the game feel more realistic. The only real change made was in putting as the game doesn’t tell you exactly where and how hard (or soft) to hit. Instead, you are given a general idea of the best possible path to guide the shot. The tweaks make putting the most difficult and rewarding part of the game. I didn’t like it at first but now it makes hitting both small and big putts a lot more satisfying. Now onto the bad news. First off, the game is lacking in content. 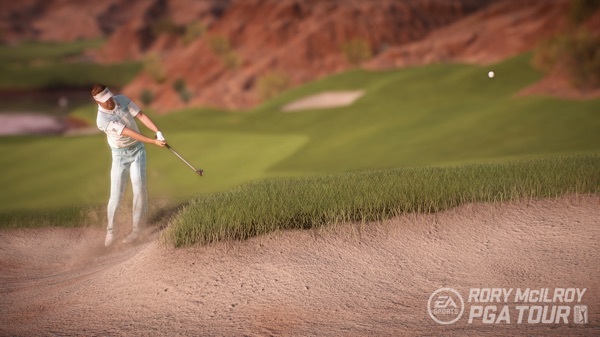 The last golf game EA released was Tiger Woods PGA Tour 14 and was packed with 20 courses including Augusta National and Pebble Beach, two of the most renowned courses in golf. These courses are nowhere to be seen in Rory McIlroy PGA Tour. In fact, the game only comes with eight courses; nine if you pre-order the game. That’s unacceptable. Furthermore, the choice of courses isn't great. There are staples like St. Andrews and TPC Sawgrass but the remaining six courses feel meek. The lack of content makes the career mode feel shallow. One calendar year offers a mere dozen tournaments, most of which aren’t branded. Others are oddly distinct, like the BioWare Classic and the EA Invitational. I don’t think those tourneys exist in real life! Most tournaments mean replaying the same courses over and over again. It’s pretty bad when I get to my third year in career mode and I’ve easily memorized most of the holes. This limits the amount of time you're going to want to invest. The sparseness of the career mode has more problems rooted in its lack of content. For one, the character creation process is sorely lacking in meaningful customization options. There are options to change clothing, clubs, and a smattering of attributes but that's it. The entirety of the experience can be summed up in two words: rinse and repeat. If you saw the E3 2014 trailer for Rory McIlroy PGA Tour, you’re probably wondering about the crazy courses it featured. There are only four of these courses that are pretty fun - once. There isn't much else to do after you play through them for the first time. The courses use the same mechanics as the rest of the game which means you're not getting a truly different experience. At best, they are a nice distraction from the main game. Rory McIlroy PGA Tour is a competent golf game that is missing the fine touches that made EA's franchise worth playing. Visually, it looks good and teh courses are excellent recreations of the real thing. The crowd animations are still jarring, however. When a golf ball is flying at you from 300 yards away, your first instinct will be to move. Instead, EA's crowd stands firm and oblivious. There are also some really weird quirks with how the game handles the golf ball's landings. If the game doesn’t like the ball landing so close to the edge of the bunker and the rough, it'll arbitrarily put your ball back in the middle of the bunker. This happened to me more times then I can count. When I look back on my week with Rory McIlroy PGA Tour, I came away feeling like it was a launch title. It's missing the robust features and course set that video game golf enthusiasts have come to know. It has a lot of the mechanics down well enough but the game doesn’t have enough content to warrant the price tag. The career mode is bare bones and the course selection is dangerously low. Unless you just can’t do without a golf game this year, you’d be better off going purchasing a game from the Tiger Woods back catalog. And until a point where Tiger does have a real rival, this is just hands down a must have golf game for any fan of the sport. Being a fan of the sport I have to say that this is a game that really doesn’t make me desire seeing other golf games, it is literally just that good.